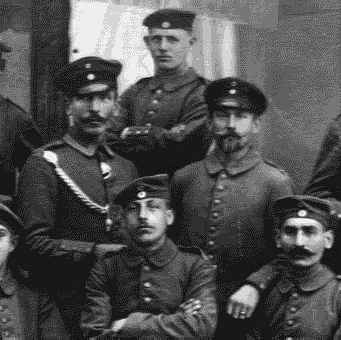 The German Army of 1914 went into battle in a uniform little changed from the 19th Century. In 1910, the Army field uniform was modernized, mainly by changing the color from blue to field grey. The modernized uniform standards maintained the rank insignia for Officers and Non-Commissioned Officers, most of which had been in use since the 18th Century Almost immediately after the start of the war, the German High Command realized that the pre-war uniform standards could not be maintained. The problems in maintaining the supply of new uniforms to soldiers in the field was a quartermaster's nightmare, and the mass of new volunteers only made the problem worse, see "Changes to the German Field Uniform, 1914-1916". In 1915 the M1910 Waffenrock was officially replaced by the much simpler M1915 Bluse, although the M1910 uniform continued to be used throughout the war. During 1915, the rank insignia of all Non-Commissioned Officers was simplified as well. The rank insignia worn by German officers followed a simple pattern. There were three different types of braided Achselstücke (Shoulder Boards), one type for generals, another for field officers, and a third type for company officers. Officers in each class wore diamond shaped stars, also called "pips", to indicate rank, the junior rank in each class had no pips. The braid on a general's shoulder boards were sewn onto a base showing a red edging. Prior to 1915, the edging on other officers and enlisted men's shoulder boards were the color assigned to the Corps the soldier's unit was affiliated with. After 1915, the color of the edging of officer's and enlisted men's shoulder boards was set by the arm of service color, called the Waffenfarbe. The Waffenfarbe for Infanterie was white, cornflower blue for Dragoner (Dragoon) and Landwehr cavalry units, red for Ulanen (Lancer) cavalry and Feldartillerie (Field Artillery) units, gold for Fussartillerie (Foot or Heavy Artillery) units, black for the Ingenieur und Pionierkorps (Combat Engineers), and bright blue for Train units. For generals, the braiding of the shoulder board consisted of a threefold plaiting, one strand of silver cord between two of gold. 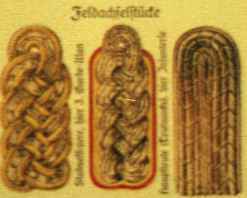 For field officers, the braids consisted of two rows of silver cord, each made up of two strands stitched together, giving the appearance of four strands. Company officers had a similar double cord, but unbraided. The Illustration below shows the shoulder board insignia of a Generalmajor, a Major, and a Leutnant. General officers wore ornamental collar patches. In most cases this was an ornamental gold tassel on a red background, as worn in the late 18th Century by the Alt-Larisch infantry regiment of the old Prussian Army. 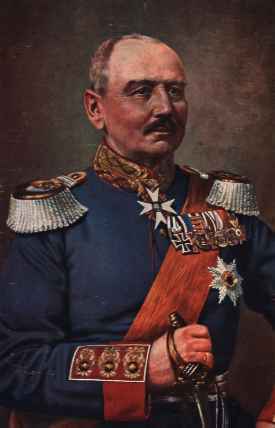 Generals from Bavaria, Saxony, and Wurttemberg, still nominally independent kingdoms within the German Empire, had different patterns for collar patches. After 1915, some generals, as well as other officers, chose simplified uniforms and rank insignia in keeping with the simplifications of enlisted men's uniforms. The peacetime regulations provided that certain senior NCO's could be promoted to the rank of Feldwebel-Leutnant on mobilization, to fill positions as platoon commanders, for which commissioned officers were in short supply. This system was extended during the war, but only those who had retired as senior NCO's before the war, and were of good character, could be given this appointment. Some retired officers were also called up to serve as a Feldwebel-Leutnant. In practice the Feldwebel-Leutnant was given administrative duties, and generally did not serve on the front lines. 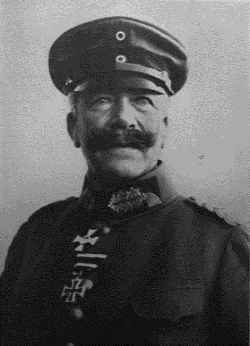 To meet the demand for junior commanders in the field, the rank of Offizier-Stellvertreter (Deputy Officer), was created on similar basis, although such men could not rise above platoon command. They were treated as officers in the field, but were not entitled to the privileges of a permanent commissioned rank. With high casualty rates of junior officers during the war, there were occasions where an Offizier-Stellvertreter, or other senior NCO's of special merit, were promoted to Leutnant. 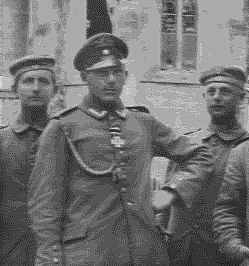 Both the Feldwebel-Leutnant and the Offizier-Stellvertreter wore the uniform of a Vizefeldweble with an officers sword. The Feldwebel-Leutnant wore an officer's shoulder board and NCO lace on the collar and cuff, as well as NCO buttons on the collar. The Offizier-Stellvertreter wore the enlisted man's shoulder board but with a lace edging, and with the regimental devise in metal instead of embroidery. A Fähnrich (Officer Cadet) ranked between a Vizefeldwebel and a Sergeant. He wore the uniform of an Unteroffizier with an officer's sword knot on the bayonet, but did not wear an officer's sword until he had passed the prescribed examination. He then became a Degenfähnrich, ranking above a Feldwebel. Upon completion of training, the Degenfähnrich would be promoted to a Leutnant "temporarily without commission". After being approved by his fellow officers, the commission would finally be granted. NCO's rank insignia was mostly confined to rings of lace around the cuff, and lace edging and buttons on the collar. NCO rank insignia was also indicated on the greatcoat. In addition, the Vizefeldwebel and above wore an officer's sword knot and a peak on the field cap. 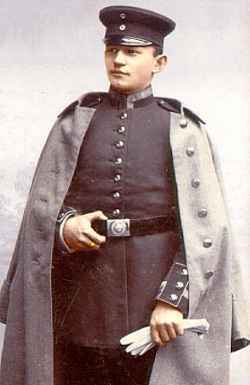 In peacetime, a senior NCO might wear an officers's spike on the enlisted man's pickelhaube, which was taller than the standard enlisted man's spike. Senior NCO's would also wear an officer's sword knot on their bayonets, in place of the less ornate enlisted man's bayonet knot. After the uniform simplifications of 1915, NCO insignia was also simplified. The 1910 uniform regulations called for a continuous band of NCO lace at the collar, and sleeve cuff. After 1915 the collar lace was reduced to a "V" at each side of the collar, this pattern was also used on the M1910 Waffenrock, which continued to be used throughout the war. The M1915 Bluse had turned back cuffs, in place of the complex Swedish and Brandenburg cuff of the Waffenrock. The uniform standard called for a short section of NCO lace to be placed at the top of the turned back cuff. In practice, the cuff lace was rarely used, only the collar lace remained. Pre-War NCO lace was a gold or silver fabric, depending on the regimental standards. After 1915 the gold and silver lace was replaced by a subdued type. The official designation was a mat grey lace, but standards varied considerable, including dark tan rayon, mouse grey rayon, field grey rayon, gray paper cloth, field grey paper cloth with white borders, and various combinations of the above. NCO collar buttons were also affected by the simplifications. 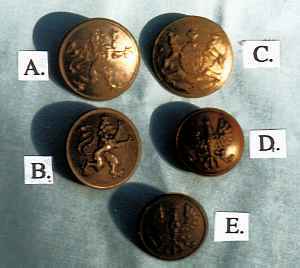 Pre-War NCO buttons were gold or silver, in accordance with regimental standards. After 1915 they were made from steel, and painted in a variety of colors, including field grey, tan, dark green and brown. Etatmässige Feldwebel This rank corresponded to the Regimental Sergeant-major in the British Army, and was familiarly know as 'der Spiess'. Gold or silver lace around the edge of the collar, with a large button on each side, opposite the shoulder, carrying a State heraldic device (Prussian eagle, Bavarian lion, etc.). Additionally, two stripes of similar lace 16mm wide around each arm, one on the turned-back part of the cuff, and one just above it. On each of the overcoat patches, two vertical stripes of black striped worsted braid. (Company Sergeant-Major) The Same as "der Spiess" but without the second stripe of lace above the cuff. (Staff Sergeant) The same as Feldwebel, but with only one stripe of worsted braid on the overcoat collar. Sergeant Same as for Vizefeldwebel, except that the officer's sword knot was not worn. (Corporal) ame as for Sergeant, but with out NCO buttons on the collar. (Corporal) One NCO button on each side of the collar, no lace at collar or cuff. This rank occurred only in the Artillery service during WWI. (Lance Corporal) Same as for Obergefreiter, but the NCO buttons were smaller. In cavalry, field artillery, and supply units, the Feldwebel became a Wachmeister. In Jäger battalions, the unteroffizier became an Oberjäger. Private soldiers had no rank insignia, and were referred to as Soldat, or Gemeiner. In each branch of service, privates had different names: Infanterist, Jäger, Schütze, Gardist, Grenadier, Fusilier, Musketier, and Pionier, for various infantry regiments; Kürassier, Dragoner, Husar, and Ulan for various cavalry regiments; Kanonier for artillerymen; and Flieger for airforce units. double band of lace at the Brandenburg style sleeve cuff. at the collar and Brandenburg style sleeve cuff. and no NCO lace at the turn back cuff. at right, note small NCO collar disks. This short discussion was intended to give an overview of the various rank insignia used by Active units of the German Army of 1914-1918. This is by no means a complete survey, as it does not include Reserve, Landwehr, and Landsturm units. It should be remembered that while "Official" military regulations set out specific rules for regiments to follow, the chaos of wartime expediency made them only guidelines to follow as well as local conditions allowed. In examining photographs of soldiers from the period, any combination of rank insignia and uniform type is likely to be found beyond those mentioned in this short piece. I wish to thank Mr. Michael Gonzales, the curator of the 45th Infantry Division Museum in Oklahoma City, for his knowledgeable advice and help in answering my many questions.